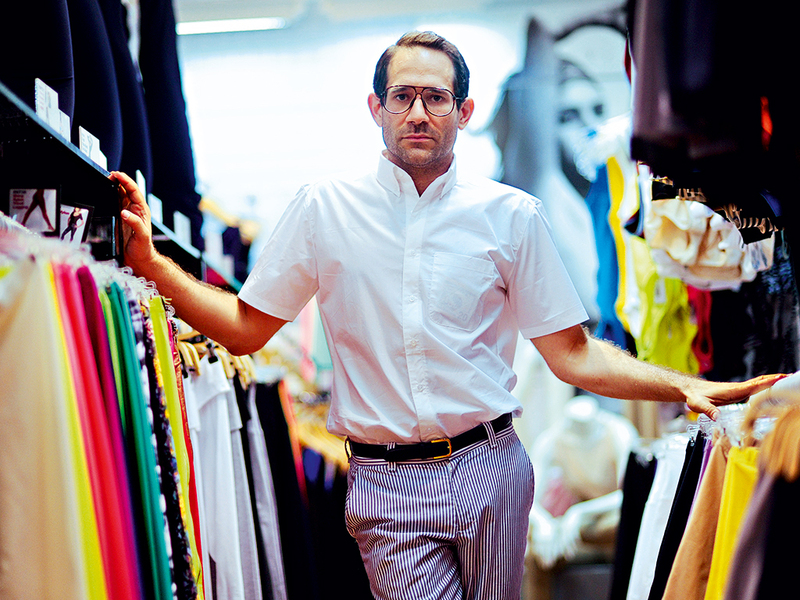 Love him or hate him, Dov Charney is one of the fashion world’s leading innovators. Since achieving his tumultuous rise to power over the last decade, the self-made entrepreneur has gone from smuggling wholesale tees across the Canadian border to single-handedly overseeing one of the largest domestic textile operations that the US has seen for a generation. In just a few short years, Charney’s trendy heritage brand, American Apparel, has earned itself both a fiercely loyal consumer base and a gaggle of fashion awards. That rise has been driven by Dov Charney’s unrelenting provocateur status. American Apparel’s controversial advertising campaigns are regularly banned for their overt sensuality; consequently racking up a flurry of priceless publicity for the brand as an instigator of dynamic public debate. Yet Charney’s overt voice has simultaneously helped the brand break ground as one of the fashion industry’s leading activists. American Apparel maintains a firm stance against foreign sweatshops, and has long been among the globe’s top advocates for improved ecological sustainability. Such political forays have proved invaluable in earning American Apparel a place of honour among the trendiest of the trendy. It’s a pity that marketing success is not translating into profitability. Since last year sales at the label’s 250 retail stores have flat-lined, and in October a third of its UK outlets were earmarked for closure. American Apparel has reported losses in 17 of the last 18 quarters, and it’s no secret that weary board members have pegged this underwhelming performance on the company’s insistent figurehead. It’s been said a number of lenders now refuse to do business with the controversial brand based upon various allegations of sexual misconduct raised against Dov Charney. With that in mind, in June the board of directors that Charney himself hand-picked tossed him out in the cold and appointed an interim CEO to rule in his stead. With the aid of new capital investors, Charney was back in-store within two months – not as the brand’s chief executive, but as a ‘strategic consultant’. Whether the role has any real gravitas remains to be seen; however, it can’t be denied that it has been Charney’s bold decisions that actively define American Apparel’s stock as a brand. The son of a Harvard-educated urban planner and a Quebecois artist, Charney was reared in Montreal and schooled in Connecticut, where he swiftly developed a passion for US heritage design. Enthralled by the sexualised style and marketing of 1970s Americana, Charney began his fashion career smuggling Hanes T-shirts across the Canadian border and turning a tidy profit flogging them off to area teens and distributors. A brief stint at Tufts University saw Charney selling his own shirt designs from his dorm room before a $10,000 loan from his father allowed him to drop school and pursue fashion full-time. With two employees under his tutelage and bringing in around $1,000 per month, Charney was off. In 1990 he took his business down to South Carolina and found relative success until one of his biggest customers failed to clear their debts. Charney’s insurance provider refused the cover the losses, and so he was forced to file chapter 11, move to California, and start from scratch. Charney landed in LA and began liaising with local manufacturers. In 1998 he entered into a series of partnerships that saw new American Apparel factories opened in Santa Fe and outside of LA. Both swam against the tide of competition by maintaining 100 percent domestic production from start to finish, and Charney began to unleash his heavily politicised management style. He became a firm advocate for sustainable employability, dishing out an average salary of $30,000 per annum to American garment workers whose Bangladeshi equivalents would bring in less than $600. If that didn’t raise eyebrows, Charney’s controversial marketing techniques did – instead of hiring expensive models, Charney recruited talent at local strip bars. This didn’t make the brand any friends among the religious right, nor the feminist left, and ads depicting Charney himself in bed with scantily clad women have since done little to earn that respect back. Yet the brand’s refusal to airbrush would-be amateur models have won it a string of advertising awards and a tinge of respect from LA’s trendy independent fashion community. By 2003 American Apparel opened its first retail store, and the seeds for success were incontrovertibly sewn. Few fashion labels have experienced the sort of rapid growth that American Apparel experienced in the years that followed. By 2005 Dov Charney was jetting across the globe, cutting the tape at a dozen new retail stores a month. His company was listed as one of the world’s top up-and-comers, having experienced a growth rate of 440 percent over the preceding three years and revenues of over $211m. That level of growth was undeniably difficult to steward, and Charney attempted to manage the vertically-led firm on every level. He would sit in on design and photography sessions, visit stores unannounced and test new products on himself. In what co-workers came to call the ‘everyone reports to Dov’ strategy, Charney would spend hours conducting weekly conference calls with shop managers across the globe, attempting to unlock the secrets to cracking diverse foreign markets. The all-encompassing management style allowed Charney to develop a keen affinity for every aspect of the business. Yet as American Apparel continued its aggressive (and costly) expansion campaign, Charney was also forced to pursue new avenues of funding. In 2007, a reverse merger saw American Apparel listed on the public exchange. As part of the deal, and as a continued vow of faith to his 10,000 employees, Charney allotted 2.7m shares of the company to its workers. The following year, Charney was recognised by the LA Fashion Awards for excellence in marketing and brand research, and The Guardian named his company fashion brand of the year. New advertising campaigns continued to shock, becoming talking points all across Europe, and the brand soon reached its peak at 250 outlets in 20 countries. Within two years, however, mounting debts began to crack the façade of Dov Charney’s ironclad, trend-setting label. Following the 2010 resignation of auditors Deloitte & Touche over unreliable financial statements, the company was forced to sell some 15.8m shares to Delvaco Capital for just 90 cents each in order to raise cash. Similarly, in April 2013, American Apparel had to issue a private offering of $206m in senior secured notes to repay a high-interest credit facility from Lion Capital. This calling in of debts couldn’t have come at a worse time for Charney, who had been spending the past two years working to settle a gaggle of costly lawsuits, including several charges of sexual harassment, while attempting to maintain his micro-managerial status as the brand’s unrelenting leader. In June of this year, Charney’s fellow board members decided that they’d had enough. America Apparel’s founder was ousted and replaced with an interim-CEO pending the results of an internal investigation concerning potential misconduct. But, perhaps unsurprisingly, Charney refused to budge. The exiled CEO swiftly turned to hedge fund bosses at Standard General for aid, and together they were able to amass 44 percent of the company’s shares, demand a board reshuffle, and inject some $25m into the ailing label (while its Q2 sales fell by another six percent in August). As part of that deal, a new, independent committee is being formed to oversee Charney’s misconduct review – and in the meantime, he’s been allowed to stay on as a strategic consultant at American Apparel. He’s still making daily appearances in retail stores, dishing out orders to area managers and visual merchandisers, and appears to be retaining his position as the label’s heart and soul. 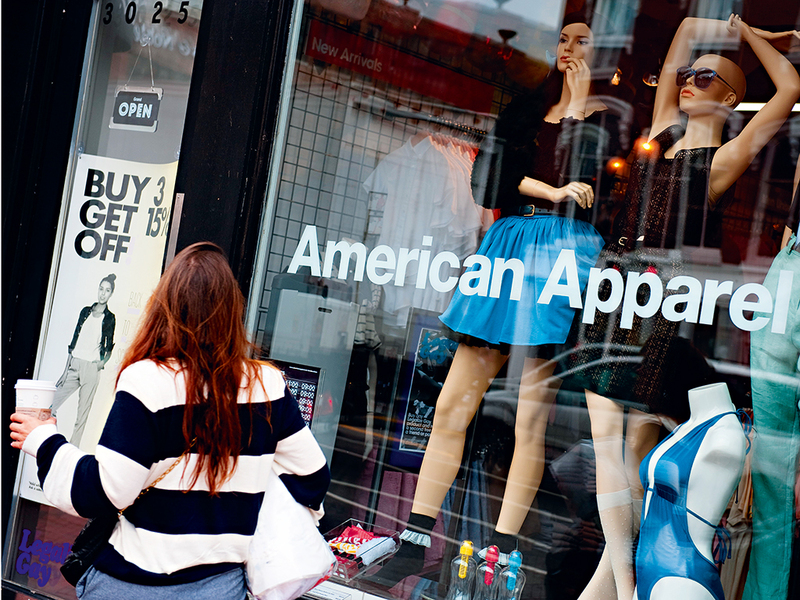 At present, the future of American Apparel appears uncertain. 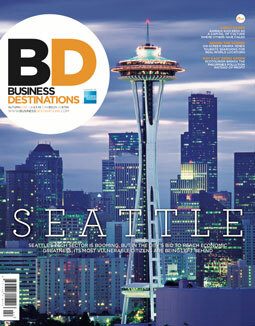 However, with an influx of new capital, an injection of fresh blood and its maintained cultural status beast of controversy, there’s plenty of hope yet for the still relatively young firm. Dov Charney’s bold decisions and acquired taste have helped American Apparel to materialise from nothingness in just a decade – at just 45 years of age, it appears unlikely the fashion world will be bidding him adieu any time soon.